breakfast | Choc - o - late - N - More! High in Protein – Low in calories! Preheat oven to 400’F. (205’C.). Lightly grease several baking sheets. Sift flour and 1/2 teaspoon of cinnamon onto waxed paper. Pour water into a saucepan. Add 3-1/2 tablespoons butter and heat gently until butter melts. Do not allow water to boil before butter melts. Rapidly bring to a boil, remove form heat and add flour all at once. Using a wooden spoon, stir quickly to form a smooth mixture. Return pan to medium heat a few seconds and beat well until dough forms a smooth ball and leaves sides of pan clean. Remove from heat and cool slightly. Gradually add eggs, a little at a time, beating well after each addition to form a smooth shiny dough. Transfer dough to a pastry bag fitted with a 3/4″ plain tube. Pipe 24 small balls onto greased baking sheets. Bake in preheated oven 20 minutes, then reduce oven temperature to 350’F. (175’C.) and continnue cooking 15-20 minutes longer or until well risen, crisp and sound hollow when tapped on bottoms. Make a slit in side of each pastry to allow steam to escape. Cool on a wire rack. Whip cream, powdered sugar and coffee flavoring until thick. Spoon into a pastry bag fitted with a small star tube. Pipe cream into pastry or use a teaspoon to fill pastry with cream. Arrange profiteroles in a pyramid-shape on a serving dish. Melt chocolate and remaining butter in a heatproof bowl set over a pan of gently simmering water. Stir in Tia Maria and corn syrup and continue stirring until sauce is smooth and coats back of a spoon. 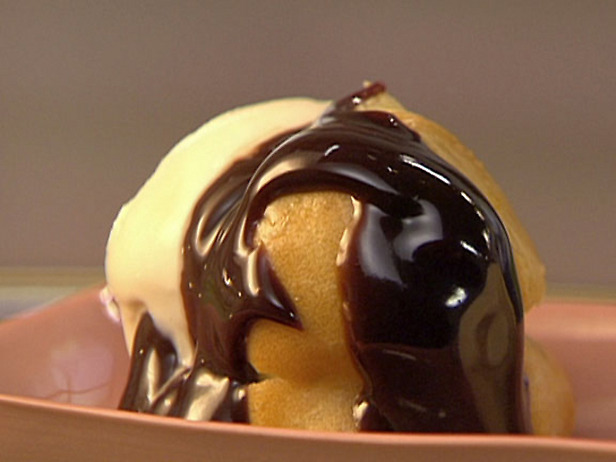 Spoon chocolate sauce over profiteroles and let stand a few minutes. Mix remaining 1/2 teaspoon of cinnamon with superfine sugar and sprinkle over profiteroles. NOTE: Profiteroles are at their best served 2 hours after assembling when they have softened slightly. In a small bowl whisk the yeast with 1 1/3 cups / 320 ml of the warm water and sugar, and set aside until foamy. If the yeast doesn’t activate, try again. 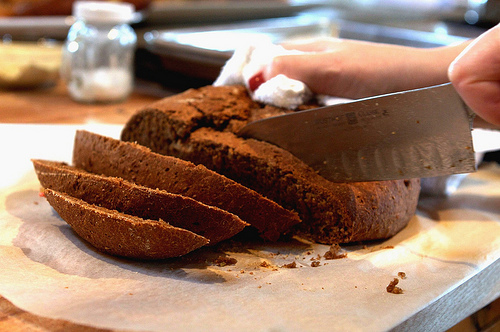 In a small saucepan over medium-low heat, combine the cocoa, coffee, molasses, caraway, butter, and salt. Stir constantly until just melted. You want the mixture to be lukewarm when you add it to the other of the ingredients. Combine the yeast mixture with the grated carrot and molasses mixture in a large mixing bowl. Add the flours, and stir until you’ve got a soft, tacky, cohesive dough. If you’r dough is too dry, add more of the warm water a bit at a time. Alternately, if your dough is a bit too wet, and you need to add a bit more flour, do so. Turn the dough out onto your counter and knead for about 5 minutes, or until the dough is elastic and springy. Note: you can do this step using the dough hook on your mixer. Shape the dough into a ball, rub with a bit of olive oil, and place seam-side down into an oiled bowl. Cover and allow to rise in a warm, cozy place for 1- 2 hours or until the dough increases in size by at least half. At this point, gently press down, with a closed fist, across the surface of the dough. Turn the dough out onto a lightly floured counter, and coerce into a pleasant-shaped round. Place directly on a very lightly oiled baking sheet, then cover loosely with a floured tea cloth or plastic wrap. Allow to rise in a warm place until nearly doubled in size, another hour. Uncover, brush gently with buttermilk, sprinkle with a dusting of flour, ~1 teaspoon caraway seeds, and use a serrated knife to slash an ‘X’ deeply across the dough (do your best not to deflate the loaf). Bake for 20 minutes at 425F / 220C. Dial back the heat to 350F / 180C, and bake for another 20-25 minutes, or until the loaf develops a structured, toasted-bottomed crust, and the loaf sounds a bit hollow when you knock on it. Remove from oven and let cool for at least 15 minutes on a rack before slicing into.